Because bluetooth does not rely on track for loco control, it is an excellent method for battery powered train operation (also known as “Dead Rail” or “Power On Board”). 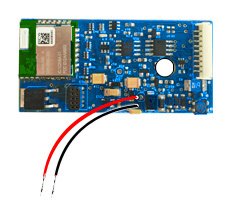 BlueRail plugin boards come with 2 connection points (+/-) which can be wired to a battery. Below are a few ways you may choose to wire your battery. The simplest way to add battery power is to add a connection that allows you to plug or unplug a battery. This simple connection makes sense if your battery is easily accessible, and is often a good first step if you are new to Dead Rail. When using this method, it is important to disconnect your battery at the end of each operating session (otherwise the battery will continue to power the board and drain the battery). A nicer solution is for your on/off switch to contain a “reed switch”. This is a small component on the switch that allows you to throw the switch by waving a magnet over it. The setup below is what is included in a Dead Rail Kit (which is completely plug’n’play). You can add a charging connection (or jack) between the switch and the battery to allow you to charge your battery using a charger without removing it from the loco. Make sure the switch is in the “off” position when charging your battery. Here is an example of charging battery through the rails. You may also connect a battery directly to the red/black wires on the 9-pin JST (instead of using the battery leads). Here are some resources for Dead Rail information and products. Dead Rail Society – A great resource for DeadRail information. Dead Rail Installs – Custom Dead Rail installs and Dead Rail Kits. Please let us know if you would like your link added to this list.